Although this is a long and rambling article about being a visual artist, I’m going to have to start by talking about music. As usual, there’s a good reason for this that I hope becomes obvious later. A few days before I prepared this article, I happened to watch a gameshow on TV (called “Even Better Than The Real Thing”) where several pop/rock music tribute bands competed to see who was the best. The program was a truly surreal affair, since the studio audience consisted of other tribute bands/celebrity lookalikes. Yet, it was absolutely fascinating to watch. Although the few tribute bands I’ve actually seen perform live have been fairly faithful recreations of the bands they’re based on, one intriguing thing I’ve seen on the internet are tribute bands that put a slightly different twist on the traditional idea of a tribute band. These are bands who play covers of songs by many different bands in the same genre, bands who use a different musical style to the band they’re paying tribute etc.. But, why have I been talking about tribute bands? Simply put, because they offers some interesting lessons about making fan art. One of the things that always puzzles me are artists who only ever seem to make fan art. Although I’ve already written about this topic, I felt like returning to it again. Because, although I originally used “tribute acts” as a disparaging metaphor for the lack of originality these artists displayed, thinking about the subject of tribute bands more deeply made me reconsider what they can teach us as artists. One of the central appeals of tribute bands is that they make big-name bands more accessible. For example, during my mid-late teens, I saw Iron Maiden perform live in London and I also saw a couple of concerts by an Iron Maiden tribute band (Hi-On Maiden). The two experiences couldn’t have been more different. When I saw Iron Maiden live, I was sitting near the back of a large theatre. The music was, as you would expect, amazing and I consider it to be one of the coolest moments of my life. There were also a few amusing moments during the concert, such as when the lead singer of the support band (Trivium) ranted at the audience for throwing bottles onto the stage, or the ten-minute power cut during Maiden’s set when one of the pieces of sound equipment caught fire and had to be replaced. During this, there were synchronised waves, things thrown in the air, songs sung by the audience and other such tomfoolery. Seriously, it’s a testament to the band that they can still hold the audience’s attention even when their microphones and instruments aren’t working properly. But it was a somewhat different experience to the visceral thrill of being near the front of the crowd in a small venue, being almost deafened by the speakers and singing along until my throat was hoarse. Seeing the tribute band was like what I imagine seeing the original band during their early days must have been like. The tribute musicians on the stage weren’t famous, so the focus was almost entirely on the music they were playing. They were fans of it, just like we in the audience were. And, maybe fan art is kind of a bit like this. Because the artists who just make fan art are maybe internet-famous at the most, the emphasis is more on the art itself. They aren’t going to end up in galleries or anything like that. And their art is meant for a general internet audience. So, although it may lack the vision and originality that an artist who comes up with their own ideas will have, it is at least more of a “ground level” thing than the things it is based on are. So, if you’re going to make fan art, then try to put an original twist on it. Use a different style, use a different palette, be a little irreverent or challenge yourself to use different materials to the original artist. But, finally, it’s also worth noting that – like all musicians – all artists are tribute artists. Every artist has their inspirations, the artists who have made them want to make art or who have influenced their art in some way or another. This is, by far, the best type of “fan art” – totally original art that has been inspired or influenced by another artist, but is also it’s own thing too. It is art where the artist has asked themselves why their inspirations fascinate them so much (eg: the lighting, the composition, the colour palette etc..) and then used these answers to create art that doesn’t directly copy any part of their inspiration. Although this type of “fan art” is more difficult to make, it is by far the best! Not only is it actually original art (that you can proudly call your own), but it also forces you to use your imagination more. It forces you to work out exactly why you love the things you do and then to use these elements in an original way that appeals to you. Plus, the awesome experience of making something genuinely original that is inspired by something else will make you want to look for other things to take inspiration from – which will make your art even more unique and distinctive. So, yes, if you’re going to make “fan art”, then be creative about it. Although heavy metal is one of my favourite genres of music, I don’t own a battle vest (T-shirts are more my thing). But, I was reminded of these awesome things in a few online articles I happened to read. So, I thought that it might be fun to imagine what my ideal battle vest would look like. I vaguely thought about making a stylised original picture featuring fake album covers, but then I remembered all the fuss about when a fashion company tried this. So, instead, I thought that I’d turn it into a fan art picture about some of my favourite metal bands and/or albums (and, yes “Virtual XI” is criminally underrated!). Since this is fan art, this picture is NOT released under any kind of Creative Commons licence. Although this is a rambling article about nostalgia in general, I’m going to have to start by talking about musical nostalgia for a couple of paragraphs. As usual, there’s a good reason for this that I hope becomes obvious later. A while before I wrote this article, I was going through a bit of a musical nostalgia phase and, whilst listening to the first track of Sum 41’s “Half Hour Of Power” album, I suddenly remembered that they were one of the few punk bands that I knew about when I was a teenager. And how they seemed even cooler as a result of this. A while earlier, I had also found myself listening to “Virus” by Iron Maiden. This is a bonus track that was included on one of the first Iron Maiden albums I ever bought (the “Best Of The Beast” compilation) and it reminded me of when I first discovered the band and how I knew relatively little about them at the time, but was eager to learn. So, what was the point of this brief trip down memory lane? Well, it’s all to do with how limitations can affect and provoke nostalgia. One of the interesting things about growing up at a time when the internet was a little bit less common is that information was harder to find. These days, if I see or listen to something interesting, then it’s a simple matter of searching for more info about it online. Likewise, finding information about other things that are like it isn’t too difficult either. Yes, this is really cool – but it means that anything you find probably won’t provoke quite the same type of nostalgia when you remember it in the future. If you found something really cool 15-20 years ago, then it was a much more significant event. Chances are, you probably even have some kind of convoluted story about how you first found it. For example, I discovered Iron Maiden (in about 2000/2001) by accident because they were on the soundtrack to “Carmageddon II” – which was a game I only got by accident because it happened to be included in a multipack with the PC port of “Resident Evil 2”. Finding something cool 15-20 years ago was also a much more significant event for the simple reason that it was a bit more difficult to tell whether there were other things like it out there. As such, finding something really brilliant was like finding a rare treasure. Instead of eagerly researching it on the internet, you tended to savour it whilst also hoping that you might possibly chance upon something similar in the future. Finding something cool 15-20 years ago also relied on chance, luck and serendipity a lot more than it does now. It involved noticing things in magazines, hearing recommendations from people, happening to watch things on TV, happening to hear something good on the radio or finding random things in shops. As such, discovering cool things tended to feel like more of a matter of luck or fate than it does now. Then, of course, there’s all of the nostalgia that you didn’t actively seek out. In the days before the internet was truly mainstream, mass culture used to be much more prominent. I mean, if you asked me to name ten songs by current pop bands, I’d probably look at you like you’d asked me to translate this article into hieroglyphics. But, during my childhood in the mid-late 1990s, I could probably reel off twenty song names without even thinking about it. Why? Because it was the main type of music (aside from the occasional pop-punk or rap song) that I was exposed to back then. The only real variation was the fact that the local radio station I listened to regularly at the time also used to play 1980s pop music too. So, a lot of my musical nostalgia is from genres that I don’t really listen to much these days. Of course, limitations also provoke nostalgia in other ways too. Whether it is the graphics in older computer/video games (that force the player to use their imagination more and which place more emphasis on the actual gameplay, story etc..) or the fact that special effects in movies looked cooler in the past because there was no modern photo-realistic CGI to compare them to, the limitations involved in creating things in the past often tends to evoke a lot of nostalgia. So, yes, a lot of what makes nostalgia “special” can often be due to the limitations of the past. A few hours before I prepared this article, I ended up reading an actual honest-to-god paper comic (since it was included with a music magazine as a free gift). Not a trade paperback or a manga paperback or a webcomic, but an actual comic book (issue one of “Legacy Of The Beast” to be precise). The surprising thing was that, although the premise of the comic is really really cool (it’s a comic from 2017 featuring Iron Maiden‘s mascot Eddie), my first thought was something along the lines of “this is a standard modern comic“. Since Iron Maiden are my favourite heavy metal band, I really, really wanted to love the comic but my reaction was just a muted “this is a good, but standard, comic“. Yes, some elements of the comic’s premise were absolutely brilliant (eg: the hilariously subversive decision to make the comic’s devil-like villain use bland, conservative mainstream conformity as a weapon), there are some cool song references and some of the art looks really cool. But, so much of the comic just seemed… well… generic. This is something that I’ve noticed often in what few modern print comics (from the past 15 years or so) I’ve read. So, I thought that I’d look at a few of the reasons why modern print comics can sometimes be a little bit on the generic side of things. 1) Lettering: This is a really small thing, but it makes a big difference. Simply put, it often seems like lettering in modern comics is a little bit too “perfect” – almost like it has been done using a computer font rather than by hand. With lettering, the handwritten imperfections are what really gives it character. The occasional illegibility or “non-standard” characteristics of “imperfect” handwritten lettering show the audience that someone actually wrote the dialogue. To show you what I mean, here’s a comparison of the “imperfect” lettering from a ‘Tank Girl‘ trade paperback from 1996 and the lettering in part of the “Legacy Of The Beast” comic I mentioned earlier. [CLICK FOR LARGER IMAGE] A comparison of the lettering in Hewlett & Martin’s “Tank Girl” with the lettering in “Legacy Of The Beast” by Leon (et al). When lettering is too good, it often just looks like it has been typed quickly on a computer rather than written by hand. Yes, it’s possible that the lettering has been painstakingly written by someone who has spent years honing their craft, but lettering that is too good will often look like a standard computer font of some kind. 2) Humour/Attitude: What few modern comics I’ve read seem to have a fairly similar “attitude” to them. It’s kind of like they’re trying to be “cool” or “edgy”, but not too much. It’s like a sort of “PG-13” edginess. It adds a bit of attitude to the comics, but it often means that the emotional tone of many comics is at least mildly similar. I understand why mainstream western comics do this. They need to be suitable for a general audience, not to mention that the legacy of the American comics code probably also plays a role too. Likewise, as similar as the sarcastic humour can often be, it does at least stop the comics from becoming too “grim” or “depressing” or anything like that. But, at the same time, it also means that mainstream episodic print comics don’t really get as much of a chance to express their own personality in the way that things like webcomics do. 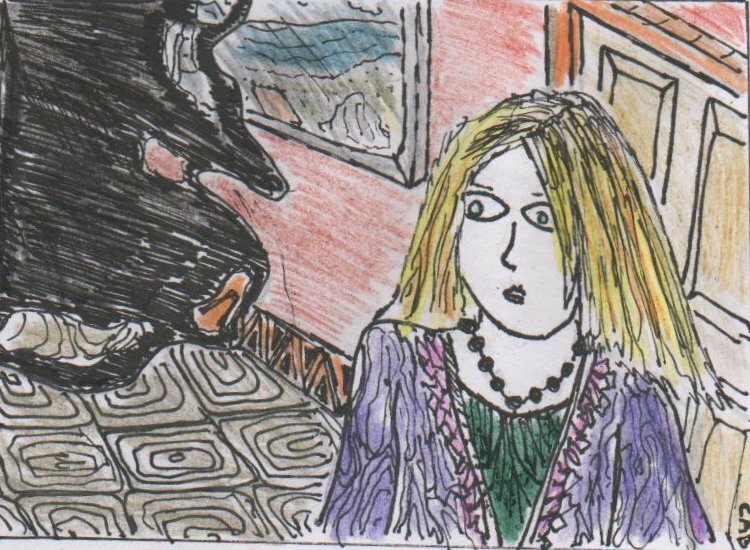 This is a panel from “muZeM” by Winston Rowntree (2015) which contains slower-paced and more realistic dialogue. The comic’s emotional tone is also a strange mixture of serious introspective drama, quirky eccentricity and occasionally hilariously subversive rapid-fire sarcasm. Even a more “PG-13” version of Rowntree’s narrative style would still stand out from the crowd. Just because a comic has to be suitable for a general audience without being blandly inoffensive doesn’t mean that personality has to go out of the window too! 3) Tools and style: First of all, there’s nothing wrong with digital art. It’s an art form like any other. I mean, most of my own art includes digital elements. Digital tools are quick, versatile and practical. There is nothing wrong with digital art. But, if it isn’t combined with a highly distinctive and unique art style, digital art can look a little bit too “perfect”. A lot of what makes traditional art so distinctive and unique are the small imperfections inherent in things like paints, inks etc.. When comics feature digital art that doesn’t really contain imperfections, then this has to be compensated for by adding uniqueness and personality in other ways. This brings me on to the fact that a lot of the (relatively few) modern mainstream comics I’ve seen often use a vaguely similar “realistic” art style. Yes, this allows for movie-style “immersion” and it allows for visual consistency in comics that may feature several artists. But, one of the things that really makes a comic stand out from the crowd is a more unique (and stylised and/or “unrealistic”) art style. 4) Heroic characters: I think that one of the reasons why I had a somewhat lukewarm reaction to the Iron Maiden comic was because it was basically a superhero comic in disguise. Yes, the comic contained a lot of fantasy elements and a few mild horror elements…. but it was still a comic about one powerful character fighting villains. This style of story is popular because it’s relatively easy to write. Likewise, if you buy a comic in this genre, then you know what you’re going to see. So, there’s a certain level of reassuring standardisation. But, at the same time, this gets boring. Many of the best comics I’ve read aren’t about one powerful hero saving the world or anything like that. For example, Neil Gaiman’s “Sandman” comics may revolve around seven ancient deities – but they’re often background characters who appear in more novelistic stories about an assortment of other characters. Warren Ellis’ “Transmetropolitan” comics may focus on one character (and his assistants) trying to stop a corrupt politician, but he’s a hilarious drug-addled cyberpunk gonzo journalist who is at least slightly more likely to use words, gadgets or ingenuity than generic mindless violence to solve problems. So, yes “heroic character fights the bad guys” storylines are probably one reason why many modern comics can seem a little bit generic. Although this is a rambling article about why some creative works can still be good even when they don’t make logical sense, I’m going to have to start by spending several paragraphs talking enthusiastically about playing an old computer game whilst listening to even older heavy metal music. There’s a good reason for this that will become obvious later. Anyway, as regular readers of this site probably know, I’m going through a bit of a “Quake” phase at the moment. If you’ve never heard of this classic mid-late 1990s computer game before, it’s basically a gothic horror-themed action game where you fight lots of monsters. But, whilst playing yet another level of the game’s “Dissolution Of Eternity” expansion pack, I suddenly realised something…. this game makes no logical sense! …But, then, I found myself in the middle of an ancient Egypt-themed level and my attitude suddenly changed. This is a screenshot from E2M4 of “Quake: Dissolution Of Eternity” (1997) [an expansion for “Quake” (1996)]. This one level is amazing! Almost instinctively, I paused the game for a second, went through my music collection and started playing an ancient Egypt-themed heavy metal song by Iron Maiden called “Powerslave” loudly in the background. Then I continued playing. Iron Maiden’s music suddenly felt just as awesome as it did in the months after I first discovered the band during my early teens and “Quake” suddenly felt just as cool as it did when I’d previously played it during my childhood, my mid-late teens and my early-mid twenties. And I realised that I didn’t give a damn that this game’s story and premise made no sense whatsoever. It was just awesome fun for the sake of awesome fun. So, what was the point of this? Well, it’s an illustrative example of how (and why) a creative work can still be enjoyable even when it doesn’t make perfect logical sense. “Quake” is just a game about shooting random monsters and “Powerslave” is a random song about ancient Egyptian gods, death, servitude and… pharaohs? I don’t know. But, the experience of playing “Quake” and/or listening to “Powerslave” is brilliant regardless. A good literary example of this kind of thing would be Poppy Z. Brite’s “Lost Souls”. This is a novel that is almost plotless, yet it is one of my favourite novels of all time purely because of things like the atmosphere, the narrative style, the characters and the general “attitude” of the book. On a purely story-based level, it shouldn’t be a great novel. But, thanks to all of this other stuff, it is an astonishingly great novel. The same is true for art too. A painting or drawing doesn’t have to be 100% realistic or even a depiction of part of a logical story to be impressive. If the artist’s style, the composition, the lighting, the use of colour etc… is interesting enough, then the fact that the picture makes no logical sense or has no deeper meaning doesn’t matter because it is a demonstration of the artist’s technical skill and aesthetic sensibilities. So, yes, creative works don’t “have” to make sense in order to be interesting or enjoyable. However, this only works if the creative work in question has some other underlying element that is inherently interesting, fun, evocative or fascinating. Well, I’m still in the mood for making gothic art set in Aberystwyth (and, yes, today’s art also comes in a “non-rainy” version too). Today’s digitally-edited painting is a piece of art that I had originally planned to make eight years ago (when I was actually living in Aberystwyth). 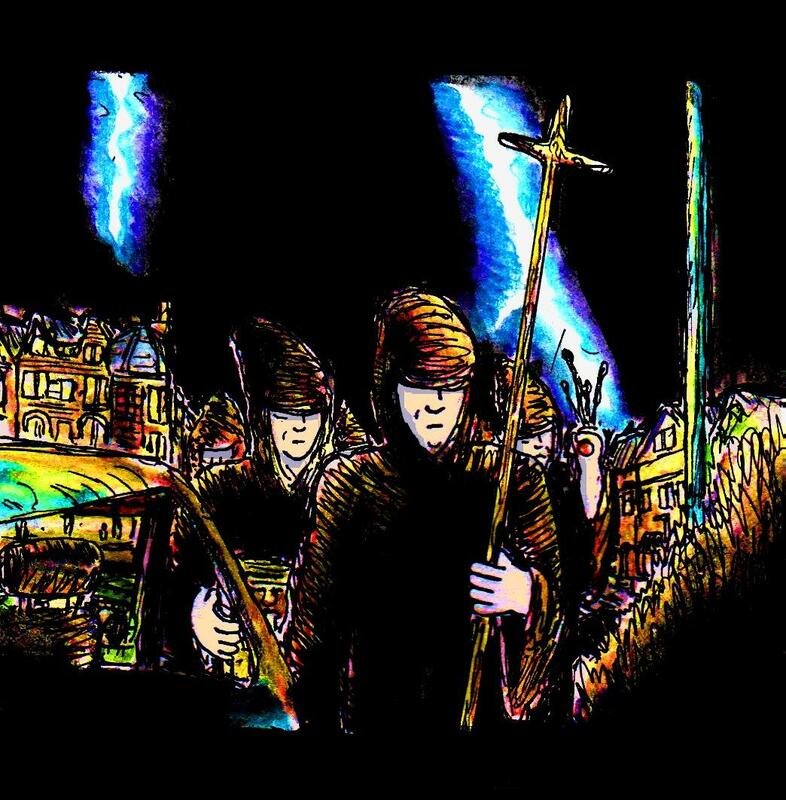 In early 2010, I was listening to “Sign Of The Cross” by Iron Maiden and the song suddenly prompted a random daydream about a group of medieval monks marching ominously through one of the town’s supermarket car parks (but, a different one to the one in the painting). I’d thought about making a drawing based on this at the time, but never got round to it. Which is just as well, given how inexperienced I was at making art back then (seriously, here’s one of my drawings from summer 2010), I’d never have done it justice. Plus, the eight-year time gap gave me time to play a cool old game called “Blood” which reminded me of how hilariously melodramatic ‘ominous monks’ can be. As usual, both the finished version of this painting and the “non-rainy” version are released under a Creative Commons BY-NC-ND licence. Well, since I’m still in something of a musical mood at the moment, I thought that I’d take a break from talking about Nightwish and look at something by one of my other favourite bands – the one and only Iron Maiden. In particular, I’ll be taking a look at their “Rock In Rio” concert DVD boxset from 2002. This was the very first Iron Maiden DVD that I ever got (my first Iron Maiden CD was either a charity single taken from this album, or the CD bonus tracks on the “Carmageddon II” game disc) and, despite the fact that one of my favourite T-shirts is based on the cover art for this DVD, it was something that I’d forgotten about slightly. It had languished unwatched for years on the shelf above my computer until, during a slight moment of boredom shortly before writing this article, I decided to dig it out again…. Wow! I can’t believe that this DVD is over 15 years old! How time flies! Rock In Rio” is a recording of Iron Maiden’s set at the Rock In Rio festival in Brazil in 2001. This was about a year or two after Bruce Dickinson rejoined the band following several years apart from them, and the DVD is something of a celebration of both this and of the beginning of Maiden’s more “modern” phase. Gone is the more falsetto-heavy sound of Bruce’s original time with the band during the 1980s and 1990s. Instead, it is replaced by a slightly louder, deeper and more serious singing style that is synonymous with Maiden’s more current stuff. Although it probably took place during the tour for Iron Maiden’s then-new “Brave New World” album, Rock In Rio’s two-hour setlist is crammed with classic songs, with only about five songs from “Brave New World” making their way onto the stage. But, since “Brave New World” is probably one of Maiden’s weaker albums (if such a thing even exists), the classics-filled setlist really helps to show the band at their best. One interesting thing here is that Bruce also sings both old songs that were originally performed by Paul Di’Anno (“Wrathchild”, “Iron Maiden” and “Sanctuary”) and, more surprisingly, two songs from Blaze Bayley’s then-recent tenure with the band (“The Clansman” and “Sign Of The Cross”). Needless to say, he brings his own unique interpretation and energy to these songs, turning Di’Anno’s more punkish renditions of these songs into something closer to modern Iron Maiden and turning Bayley’s broodingly dramatic performances into something even more epic and dramatic. Seriously, I cannot praise Bruce’s rendition of “Sign Of The Cross” in this concert highly enough! It is, by far, the stand-out track on the DVD. Perhaps even the definitive interpretation of the song in question. He takes a solemn, ominous, emotional song and turns it into ten minutes of spine-tinglingly energetic passion and menacing quietness. The Siiiiiigggnnnn Offff The Crrrrooosss!!!!!! In terms of Iron Maiden’s performance, they are as energetic and enthusiastic as you would expect – with each song roaring loudly through the speakers as Bruce Dickinson runs and leaps around the stage in his usual fashion, whilst the other band members swagger around and have fun. There isn’t a weak or lacklustre performance during any part of the concert. All of this passion and energy is emphasised through a lot of fast video editing, which rarely lingers on a single shot or camera angle for more than a few seconds. Seriously, if there’s one thing to be said for this concert, it is that the band are having fun. And it is a joy to watch! Bruce occasionally makes amusing comments to the audience, whilst the other members of the band do all sorts of hilariously silly and/or cool stuff, like throwing their guitars into the air. You really get the sense that these are six expert musicians who love nothing better than putting on a great show. And what a show it is! The stage design, lighting design and filming still stands up to this day! Unlike the more limited concert halls from many of their earlier live videos (and the one time I actually saw them live – at a theatre in London in 2006), the band take full advantage of the extra real estate offered by the gargantuan outdoor stage. Multicoloured lights glow beautifully in the darkness, a helicopter hovers above the festival to provide a few dramatic aerial shots, and then there’s the stage design itself. Seriously, this is one of the coolest-looking stages that I’ve ever seen! The stage is filled with scaffolding and corrugated metal panels, which help to lend the stage a slightly “dystopian sci-fi” kind of look, whilst also providing a handy climbing frame for Bruce during a few instrumental moments. The backdrop changes several times during the set, varying between art from the band’s albums and a plain black background. Needless to say- later in the set – the band’s mascot Eddie makes his appearance. This time, he’s a giant wicker man filled with pagan-style dancers. Surprisingly though, Eddie doesn’t appear during “The Wicker Man” at the beginning of the concert, but during “Iron Maiden” (about two-thirds of the way through the show) instead. Naturally, Eddie also has glowing red eyes too. Because, would you expect anything less? My only real criticism of this DVD has to do with the packaging. For some reason, the discs are packaged inside a thin cardboard sleeve and held in place by two sticky pieces of sponge. To call this flimsy would be an understatement! In fact, when I opened this DVD case after quite a few years, both discs almost fell onto the floor and the piece of sponge holding the special features disc in place seemed to be missing. Needless to say, this has caused scratching to both discs and, to my horror, I found that a few moments of the concert disc were unplayable as a result. Likewise, when I put the concert disc back into the case, I had a rather difficult time getting it to sit back on the spongy circle, which seemed to have expanded somewhat. As for the special features disc, I didn’t really have time to rewatch it before writing this review but, from what I can remember of it, it contains documentary footage of the band during their time in Brazil, as well as interviews with the band etc…. All in all, DVD packaging aside, “Rock In Rio” has stood the test of time surprisingly well. It is two hours of pure energy and passion, and it is an absolutely stellar introduction to the band if you’ve never heard them before. If you’re looking for an epic music video, you can’t go wrong with this one! Whether you watch it in one sitting or just skip from song to song, it’s something that can be enjoyed again and again. Yes, it might lack some of the pyrotechnics and/or background animations that characterise more modern concert footage from metal bands, but it is still pretty much timeless. If I had to give it a rating out of five, it would get at least five.